We only had a relatively short journey planned today so we stopped at the water point at the base of Hillmorton Locks, even though we knew from experience it was a slow filling tap. This gave us time to have breakfast and get rid of rubbish, whilst we waited. At 9.30 we set off up the locks, several boats had already passed us and gone through, so none were set in our favour. The pounds between the locks are renowned for being low, and we usually scrap the bottom in places but not today. There was even water flowing over the top of the bottom lock gates. Once at the top of the flight we passed the site of the former Rugby Radio Station. This used to be a familiar sight especially to travellers on the M1 and M6, with fields full of radio masts. These have now virtually all gone, and the site is going to be used for housing. 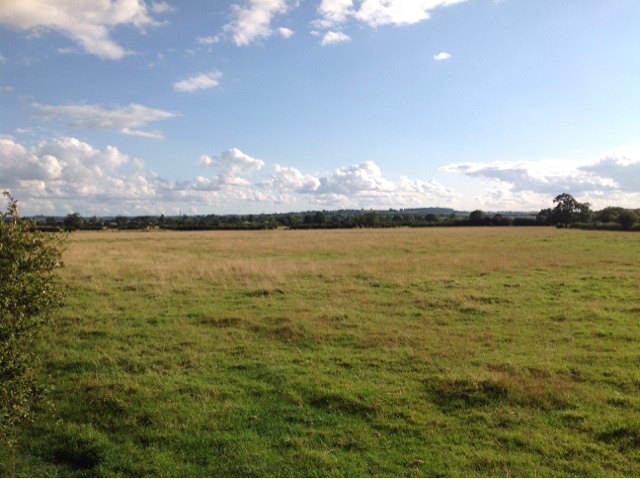 In a couple of years the area around Hillmorton Locks will be completely different. We then entered the Barby Straight, a section of canal arrow straight for about a mile and a half. We passed the villages of Barby and Willoughby, then arrived at our mooring spot just a mile from the village of Braunston. Just a few pictures of our mooring spot. This is a nice rural spot and normally we would stay here maybe a day or two. 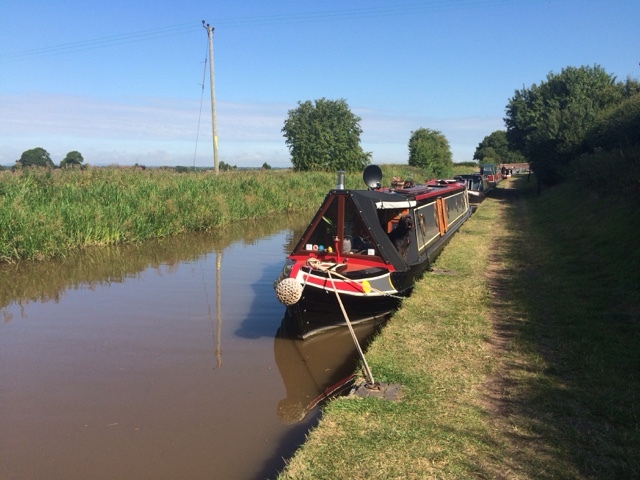 However as this coming weekend is a bank holiday we want to be settled nearer to Napton and Calcutt Boats before the weekend boaters pour out of the nearby marinas. The other benefit of being near Napton is we will be close to a delightful pub we know, The Folly Inn. 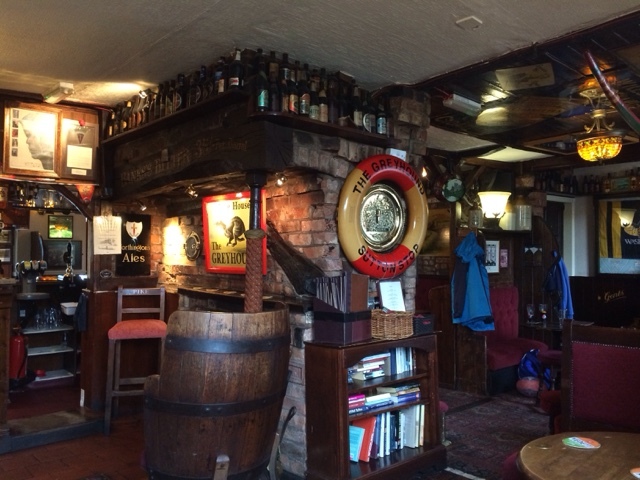 After securing the boat we walked into Braunston for lunch at The Boat House, followed by a visit to the swindlers, also known as Midland Chandlers. We went in just to have a look, and I was hoping not to spend anything. I failed. We had a later start this morning allowing time for the rain to clear. 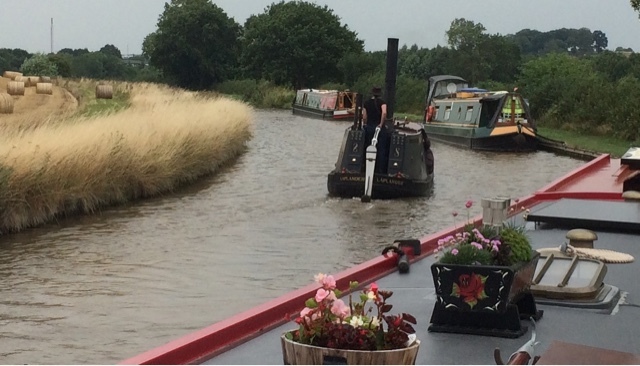 Hawkesbury Junction had proved busy and we still had boat traffic moving at 10.30 pm last night. Today our aim was to reach All Oak Wood near the village of Brinklow. As we set off it was still cloudy, but breaks were starting to appear. After a couple of miles we were passing through the village of Ansty. Unusually, the visitor moorings here were empty, and a few miles further on we found out why. Everyone it seemed was moored at All Oak Wood. We reviewed our options and decided to push on to Hillmorton. As we had passed under the M6 and through an overgrown section of the canal we had seen another steam boat approaching. 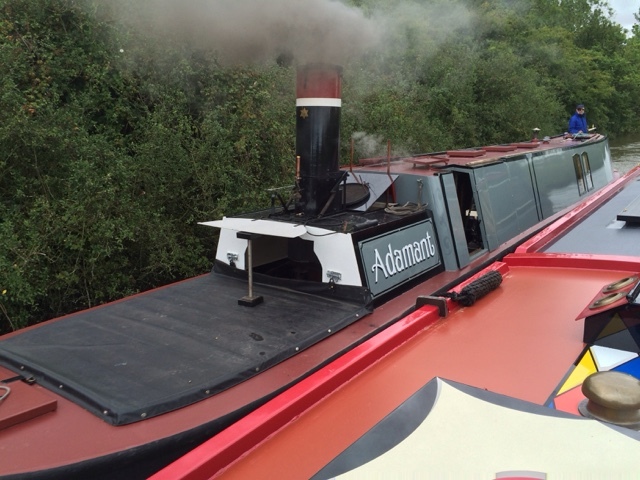 On this occasion it was the steam boat Adamant, an example of a steam tunnel tug. Just as we were passing the steerer gave a long toot on his steam whistle making the crew jump. I thought the camera would end up in the canal. We continued on through the swing bridge at Stretton Stop, and beyond Brinklow. Next, was the short Newbold Tunnel, and once through we were entering the outskirts of Rugby. We passed the short arm that leads to the Willow Wren hirebase, and the park at Brownsover with mooring on both sides of the canal. On the approach to Hillmorton Locks we found a spot to moor. The bank here slopes a bit and is concrete so it is difficult to get close into the edge. Our plan for tomorrow is to ascend the three locks and travel a few miles on towards Braunston. 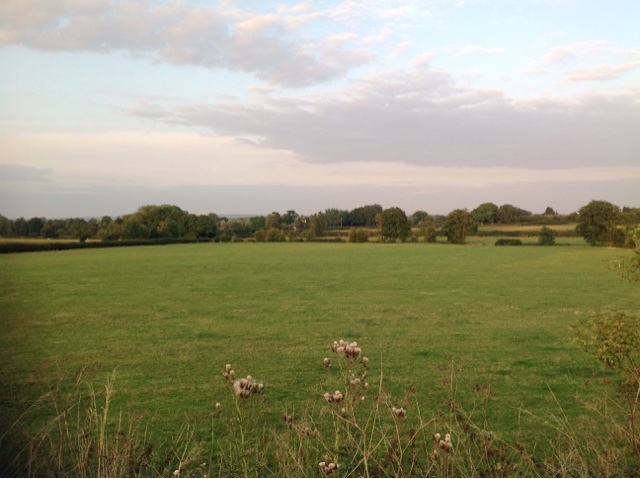 There is a nice rural spot a couple of miles before the junction where we will turn towards Napton on Friday. Only a short journey of seven miles today. Departing Hartshill at about 9 am we were soon passing through the town of Nuneaton. It would appear that this town does not value its stretch of the canal, as we saw more rubbish and plastic bottles in this area, than we have, over the entire remainder of the canals we have travelled this year. 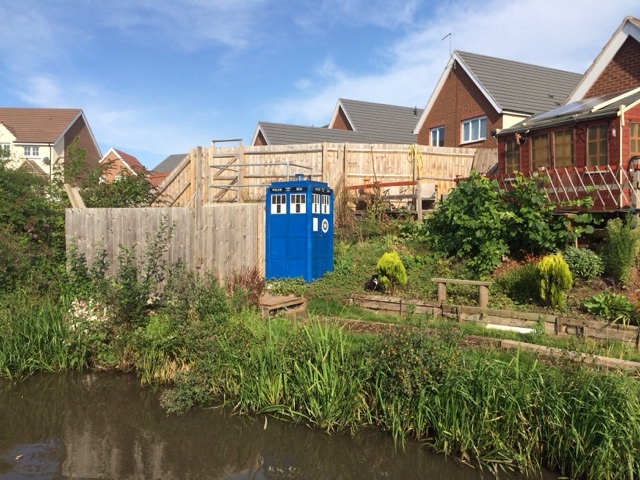 Anyway, we were soon leaving Nuneaton behind when we saw evidence a certain 'Time Lord' was visiting. 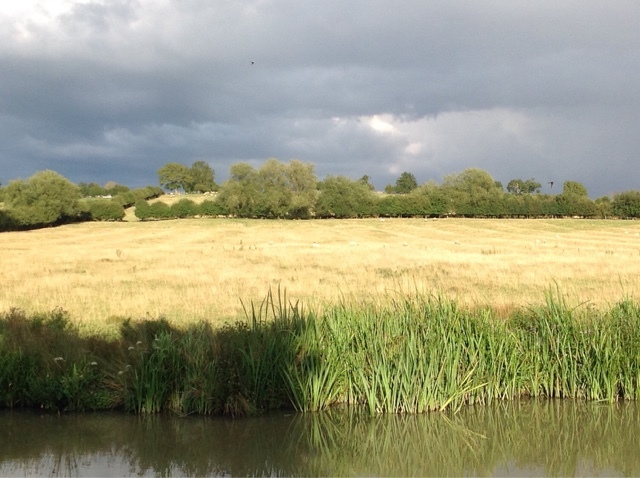 Not long after passing the junction with the Ashby Canal, the skies clouded over and wind picked up. Rain was threatening again and it turned decidedly chilly. About two miles later we made the left turn off the Coventry Canal and entered Sutton Stop Lock. Once through we were on the Oxford Canal, which will now take us all the way to Napton for our appointment with Calcutt Boats next week. We moored a couple of hundred yards from the lock and secured the boat. Previously, we had only visited the Greyhound P.H. for a drink so today we sampled their menu. Just as we left the pub the rain came, so it was back to the boat to plan tomorrow's journey. It will be another short hop as far as the village of Brinklow and All Oak Wood. Since our last post from Coven, we have been making good progress on our return journey. 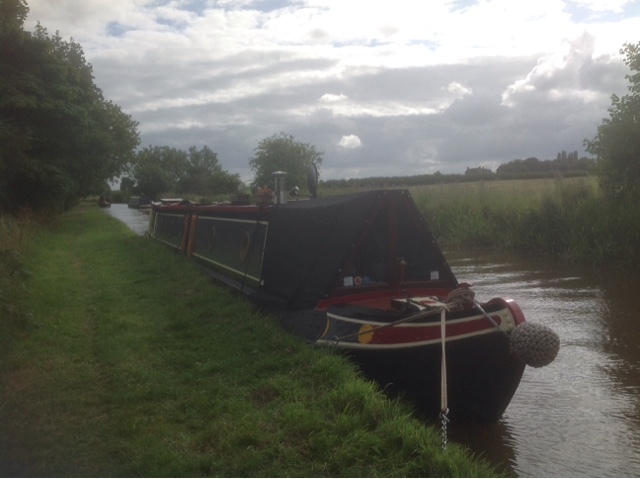 Wednesday 19/08 we set off for a mooring near to the village of Acton Trussell. We had 10 miles and 10 locks to navigate, whilst keeping an eye on the changing weather situation. No sooner had we secured the boat the rain came, we had timed it perfectly, which was a theme repeated during further legs of the trip. Thursday 20/08 our destination was to be Great Haywood. It meant passing through Tixall Wide, but we fancied having the grounds of Shugborough Hall as our backdrop. On route we passed Stafford Boat Club which had been our home for a week, on our way to Chester. 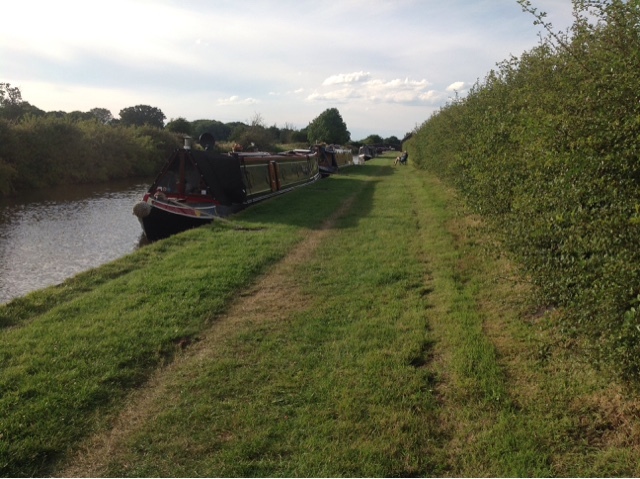 As we entered Tixall Wide, we recognised a boat moored that we had seen several times over the past few days. 'Millie Rose' was one of Steve Hudsons final boats, and we had met the owner a couple of times on our way down the Shroppie. What we did not expect was to see the crew of 'Lowen' another Hudson boat popping out of the rear doors. We had not seen them for over a year since the last Hudson open weekend, so we made an unscheduled stop on the Wide for a catch up. About an hour later we resumed our journey to the junction with the Trent and Mersey, then turned right and descended the lock before mooring in front of Shugborough Hall as planned. 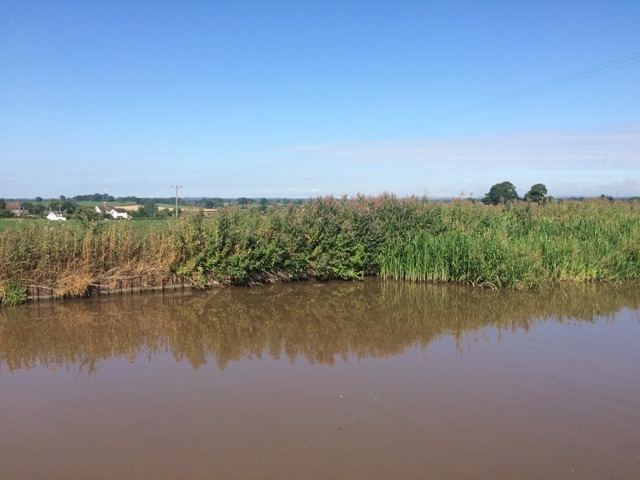 Friday 21/08 our planned destination was Fradley Junction, but we saw an opportunity to extend the day and then have a rest day on Saturday. We passed the pig farm and fuel barge near Bishton which seems a popular mooring spot, then continued on through Rugeley and Armitage before arriving at Fradley. We descended the locks with the help of the volunteer lock keepers, and turned right onto the Coventry Canal. Our revised destination just prior to the village of Whittington, was a further five miles away. We secured the boat mid way between Huddlesford and Whittington, and decided that having foregone lunch, an early evening meal was called for at the Plough Inn. Saturday 22/08 was a warm, very humid day, and the furry crew member did not appear to be enjoying his walk in the heat. We therefore kept it short, simply collecting a few supplies from the co-op in the village, then returning to the boat to relax and attempt to keep cool. Later, we were treated to a brief thunder storm which cleared the air a little. 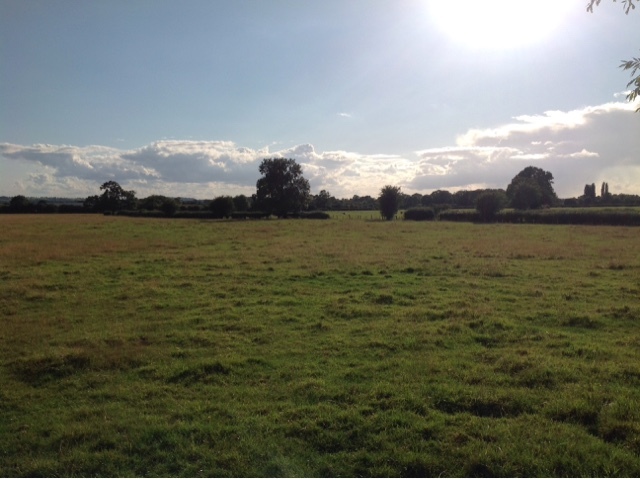 Sunday 23/08 our aim was to reach Polesworth. We made good progress to Glascote where we had two locks to navigate. Both are renowned as slow to fill. The bottom lock takes 8 minutes and top lock 12 minutes. The Canal and River Trust are closing them on Wednesday to conduct an inspection and see what the problem is. 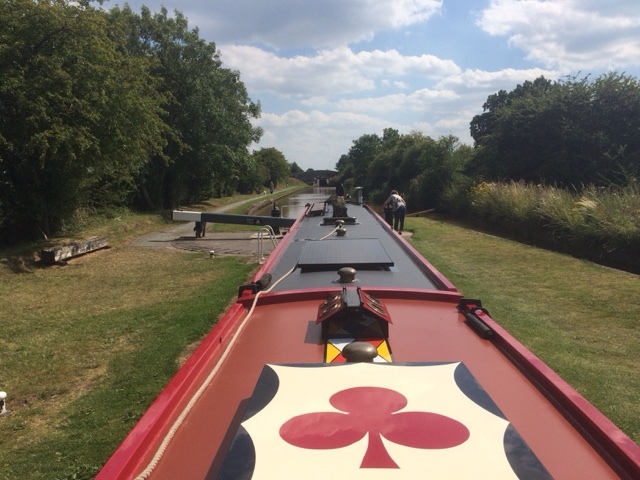 After exiting the top lock we passed the entrance to Glascote Basin, our boats home port. This has now been taken over by Norton Canes Boatbuilders, so we popped in for a brief chat. Resuming our journey we passed through Polesworth, taking a mooring just prior to bridge 50. We were close to the main railway line here, but the mooring is shielded by a small hill making it quite a pleasant spot. The Icebreaker Lysander now converted to run on steam. Departing our mooring this morning at Polesworth. Today we had the Atherstone flight of 11 locks to deal with. The rain was not expected to arrive until late in the afternoon. Just as we slipped our lines it began to drizzle. Fortunately it was short lived. We used the services at the base of the locks, then set off up the flight. The first two locks went without incident, but then we encountered very low water in the pound between locks 10 and 9. Someone who had gone through the flight at 6 am, had left a gate paddle raised which drained the pound by nearly a foot and a half. We travelled along the pound staying in the centre of the channel. The boat bumped along in a few spots, but entry into lock 9 proved impossible. We then spent about half an hour running water down the flight to raise the levels. After this the remainder of the flight was in our favour, and for the final four locks we had volunteer lockies helping. 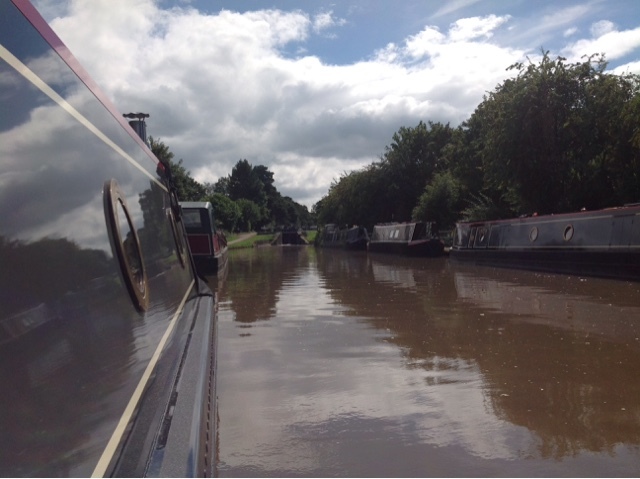 We passed the CRT yard at Hartshill, then Springwood Haven Marina. Our chosen spot was free and we moored up. Soon after the rain came and we were rapidly joined by another couple of boats. 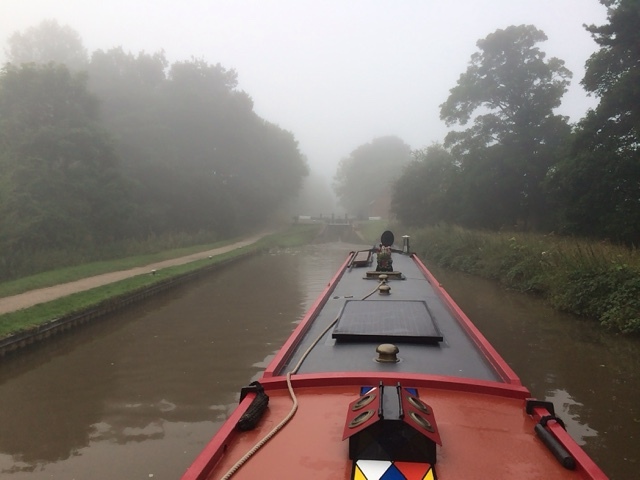 We departed Brewood early this morning hoping to pass through the narrows prior to Autherley Junction, without meeting too much oncoming boat traffic. We succeeded in that objective however the queue at the stop lock by the junction would slow us up a bit. We filled with water whilst waiting, and in no time it was our turn. Passing through the lock we turned left onto the Staffs and Worcs Canal. At this point on the canal we are on the outskirts of Wolverhampton. It is easy to tell when near a city, as the canal water appears black in colour. We had one further narrow section to pass through and could see a boat ahead of us, so we followed them in. We arrived at our planned mooring location between bridges 73 and 74 at about 1.30 pm. We now have a timescale of sorts to keep to, in that yesterday I booked our visit to Calcutt Boats for the 1st September. This is have our diesel heater repositioned in the engine room, to a more serviceable location. 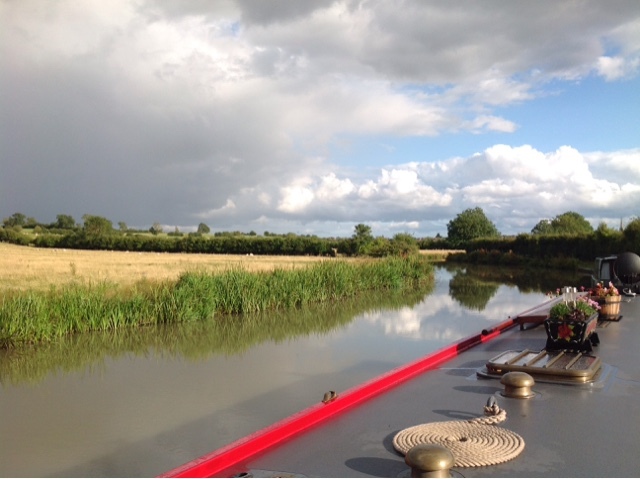 Calcutt Boats are located on the Grand Union Canal south of Braunston so we have some way to go yet. Tomorrow the weather is reported to take a turn for the worse later in the afternoon, so we will aim for another early morning start. Just before 8.30 am we moved forward the short distance to Norbury Wharf. The diesel price here is nearly the cheapest on the canal network at 59.9 pence per litre. Knowing we would be refilling here we had run the tank lower than normal, so took on 112 litres. Our trip today took us across the substantial Shelmore Embankment, before passing through the village of Gnosall and the very short Cowley Tunnel. 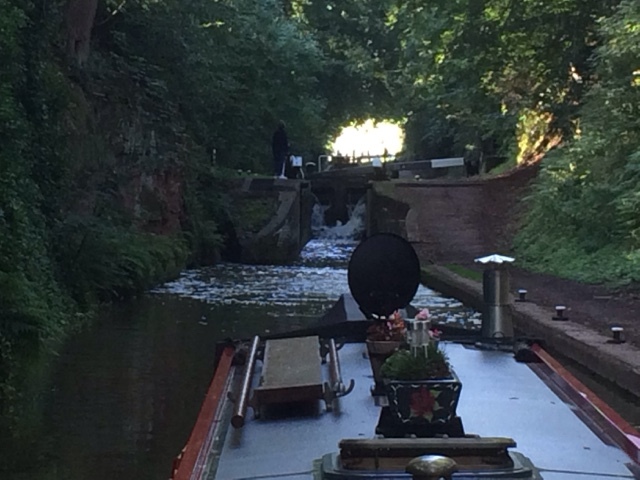 At Wheaton Aston we had a single lock to navigate, then two more miles to our destination at Brewood. We have now left Shropshire behind and are well into Staffordshire. Tomorrow we will leave the Shropshire Union Canal, as we head along the Staffordshire and Worcestershire Canal towards Coven Heath. 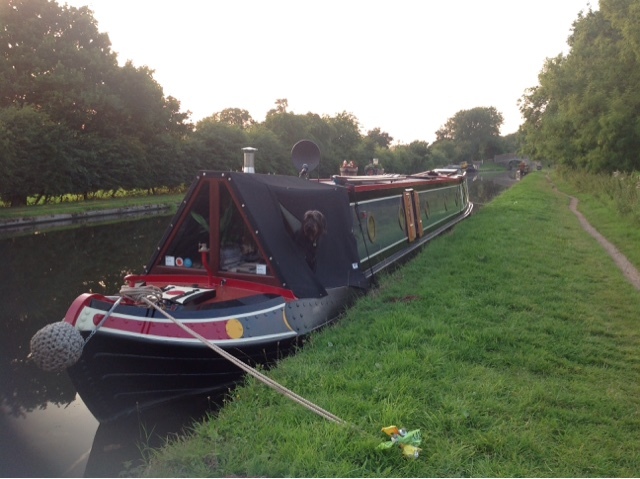 Slipping away from our mooring at Market Drayton by 8 we soon arrived at the Tyrley Locks. This flight also consists of five locks, and as yesterday, all were in our favour. As can be seen from the photo below, the lock gates at this flight leak like a sieve. You would think the paddles were raised already with the amount of water flooding through the top gate. The bottom of this flight is located within a wooded cutting, but as we ascended we emerged into bright sunshine. We have to keep an eye on the furry crew member. He has realised that if the hoop of his lead is simply placed over the small bollards he can with a bit of jiggery-pokery lift his lead off himself. 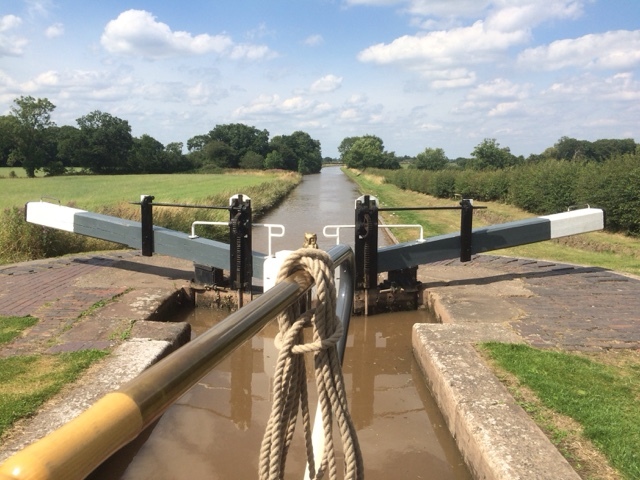 Having arrived at the top of the flight we now only have one more lock to navigate on the Shroppie. We met a couple of boats as we passed through Woodseaves Cutting so rather than rub sides with them we stopped at a wider section allowing them to pass. When about half way through the cutting we passed the location of a recently fallen beech tree. Reports were that a couple of weeks ago, chaos ensued as the cutting was blocked with dozens of boats stuck for a couple of days at the busiest time of the year. Little of the wood remained so we suspect a few liveaboard boaters have stocked up with fuel for the winter. Our next obstacle was a fishing competition, consisting of 75 fishermen spread out along a mile and a half of the canal. Boats coming the other way informed us they were very grumpy, but we acknowledged each of them as we passed and found them ok. It was like receiving a royal salute, as fishing poles were raised in turn to allow our passage. On arrival at Norbury Junction we were lucky to find a spot prior to the bridge and service yard. Our journey had taken five hours and it was now lunchtime. The Junction Inn was serving a Sunday roast and also had a decent selection of vegetarian options for the crew. We plan to fill with diesel at Norbury Wharf at 59p a litre. It is a penny a litre dearer than Wheaton Aston but the fuel filler is on the correct side here. Tomorrow we are aiming for Brewood. After yesterday's torrential rain, this morning we woke to blue sky and sunshine. We were glad we stayed put for the extra day, as the crews on the few boats that did pass us did not look happy to be on the move. 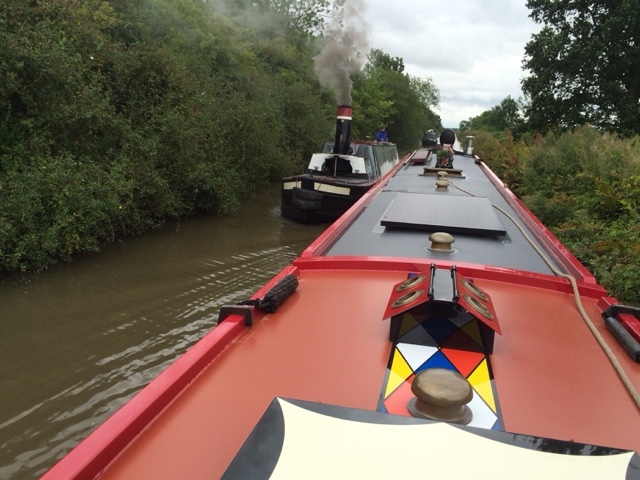 We were underway by 8 am and quickly navigated the final two locks of the Audlem flight. We have now left Cheshire behind, as we continue our journey south. About a mile further on we approached the Adderley flight of five locks. We were expecting today to be busy due to the lack of movement yesterday, but all the locks were in our favour and we only met one boat on our trip. As we passed through the top lock the local farmer was restocking the small stall with fresh and homemade produce. We like to support these local businesses so we purchased an apple pie and some toffee fudge cake. 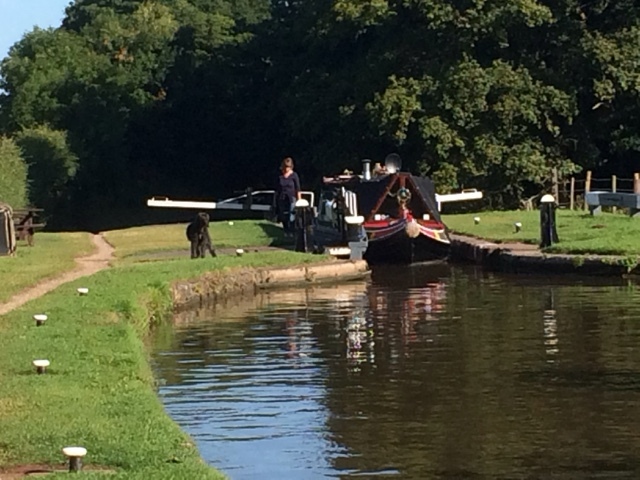 About an hour later we arrived at our destination at Market Drayton, filling up with water before finally mooring. We visited the town to stock up at the supermarket and had lunch. We are only staying here tonight, heading for Norbury Junction tomorrow. Yesterday afternoon back at the boat, we heard someone knocking on our roof. It was the crew of nb Sarah Kay, another Hudson boat that was actually at the Crick Boat Show, along side us in 2014. As both boats are a similar age it was great to be able to discuss service and maintenance tips. It was also a good excuse to visit the Shroppie Fly P.H. for an evening drink. This morning we were up with the lark and underway by 8 am. Nb Sarah Kay had got away even earlier. 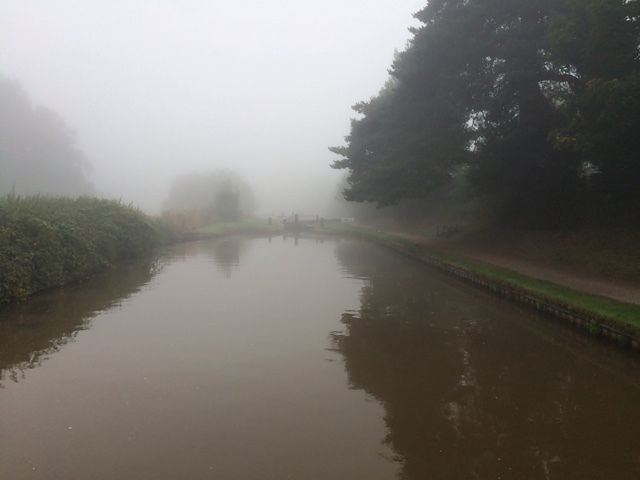 There was a fairly heavy mist hanging over the canal. Today we were planning a short 1 mile journey to the pound between locks 3 and 2. We found ourselves following another boat closely up the flight, meaning all the locks should have been set against us. The lady on the boat ahead however very helpful, lifting a paddle on the bottom gate as they exited their lock meaning it emptied for us by the time we got to it. We arrived at our destination two hours after setting off, just as another boat was departing. We had timed it to perfection, by lunchtime the pound was full of moored boats. After lunch we walked up to the top lock, and the canal side cake stall that we knew was there. I chose raspberry and almond slices, whilst the crew opted for melt in the mouth shortbread biscuits. Two boats ahead of us was nb Spirit of the Wind. We have played leap frog with the crew over several months. Today we had tastings of boat brewed elderflower wine and sloe gin in the afternoon sun. The day has remained fine with a clear sky, which will hopefully help in viewing the Perseids Meteor shower tonight. The sky will be quite dark where we are so hopefully it will be a good show. We will stay put for a day or two depending on the weather, which is reported to get a bit rough on Friday. Our next destination will probably be Market Drayton due to the need for services. Yesterday I got very closely acquainted with the hot oily green thing at the back of the boat. It was engine service day, fortunately it went without hiccup. The engine has now run just over 500 hours since new, and we have been retired and living afloat for a year. This morning the weather was changeable, but we had used up our 48 hours at Hack Green. It was a shame to leave as it is a nice spot. Today we were aiming for Audlem. There is a flight of fifteen locks there, but we were planning to stop by the village which is only four locks up the flight. The rain came just as we approached the bottom lock, however it was only a passing shower. We ascended the four locks and found plenty of mooring space in the pound between locks twelve and eleven. It was just after 12 noon which is a good time to arrive at your end destination, especially if it is a popular spot. Late enough that most will have moved off after their breakfast, but too early for most to be stopping for the night. Lunch was had at the 'Shroppie Fly' then into the village to visit the co-op. Last time we were here in Audlem, I was cheated out of a chicken kebab takeaway as we had a small leak to deal with. So I intend to make up for it this time. We plan to stay here today and tomorrow, then aim for another of our favourite spots at the bottom of the Adderley locks. Mooring in the pound between locks 12 and 11 at Audlem. Yesterday evening we were too tired to blog, following an unexpected eleven hour day. We started at 8 am and quickly navigated the two locks at Swanley, before arriving at Swanley Bridge Marina to use their services. We had a short wait here on the outside services berth, waiting for a boat to unload, presumably at the end of their holiday. So following a pump out, and taking on gas and water we were off again. Arriving at Hurleston locks, we did not have to wait as we descended towards the junction with the Shropshire Union. By 1130 we had left the Llangollen Canal behind and were on our way to Aquaduct Marina. So far we were making good time. We only had two locks on the Middlewich Branch to navigate, but this is where we hit the queues. It was over an hour wait at each before we were through. Aquaduct Marina was only a short distance further on, and we occupied the fuel berth whilst we spent lots of money in the chandlers. However I now have enough oil for the next two engine services. We took the opportunity of using the Bistro for a late lunch, before departing again on a return route towards Barbridge. The queues at the locks for the return journey were not as bad but we still had a bit of a wait. To be fair this is the first time we have encountered longish queues so we are not doing too badly. 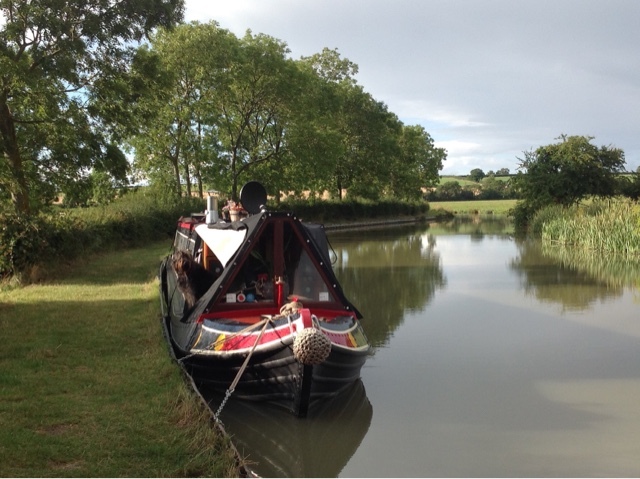 We had not intended to travel that far, but we ended the day moored opposite the Barbridge Inn. On arrival at Nantwich we saw Barolo No.3 a fellow Hudson Boat on the water point, and then within a short time nb Poppy, nb Eleanor and nb Brigand all Hudsons came past. It nearly had the makings of a Hudson convention. Nantwich is a pleasant market town with many old timber buildings, similar to Chester. In the square there was a craft market, and after perusing the stalls we attended the Red Cow P.H. for lunch. This was conveniently located next to an M&S food hall, so we popped in to stock up. Returning to the boat we again set off with the aim of reaching the moorings at Coole Pilate. We had two locks to deal with at Hack Green, luckily both were in our favour. As we passed through the top lock the crew asked an oncoming boat what the mooring was like at Coole Pilate. The answer was, "busy". On hearing this we nipped into a spot just above the locks and this will do us now till Monday. Later neighbours of ours on return from walking their dog informed us that the mooring at Coole Pilate was like Butlins so we are happy we stopped when we did. Tomorrow in addition to our usual activities we also have an engine service to perform, so our Sunday roast may have to be postponed till Monday or Tuesday. With an evening view like this we may stay longer. Still on our mooring spot near the village of Ravensmoor, we have experienced a mixture of sunshine and showers over the last couple of days. Yesterday, we walked across the fields to the village a little over a mile away. As alluded to in the previous post, we visited the Farmers Arms and can confirm they are dog friendly. They have a decent menu, if a little pricey, but the homemade chicken and leek pie was excellent. Today we walked along the canal as far as Swanley Bridge Marina. We will be in need of their pump out services when we move off on Friday, and it was nice to see that I can pull up on the outside, to access the facilities in the event it's a little windy. 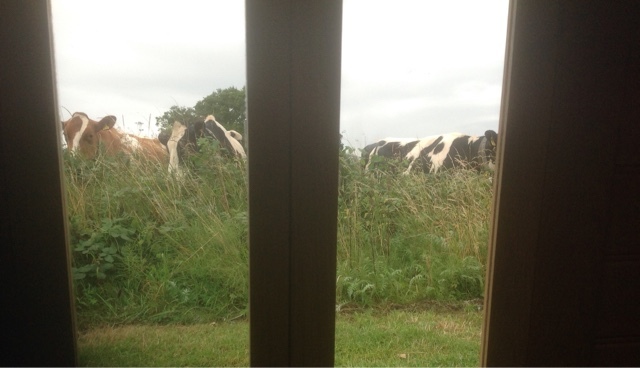 Our mooring is adjacent to a large field, and today it was full of beasts. Fortunately a fence and large bramble bush prevents them reaching the boat, as they are know to enjoy the flowers adorning canal boat roofs, and don't mind standing on the boats to reach them. They have also been known to chew through mooring ropes. 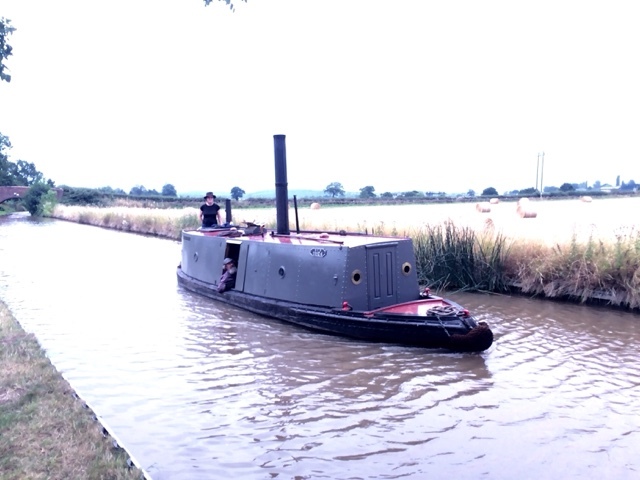 On Friday we will set off for Aquaduct Marina, then on Saturday we will aim to be at Nantwich. 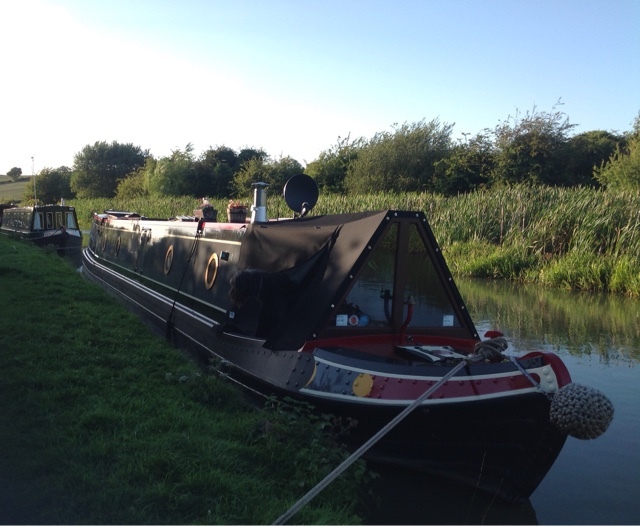 We have five weeks before we need to be at Calcutt Boats on the Grand Union Canal. 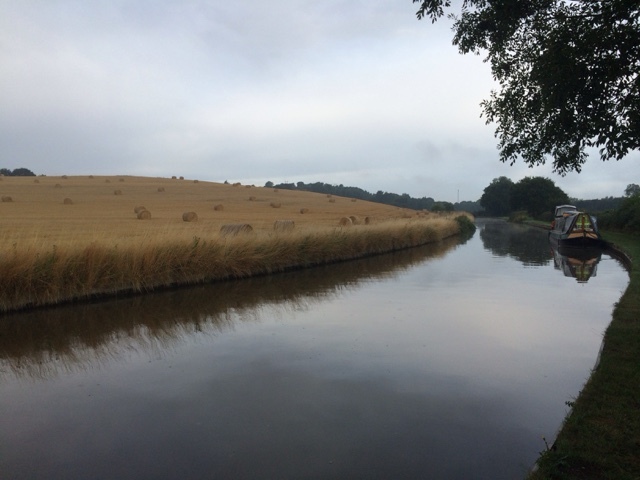 Having spent a week at Grindley Brook, during which time the crew abandoned ship for a few days, we commenced our travels again on Sunday. 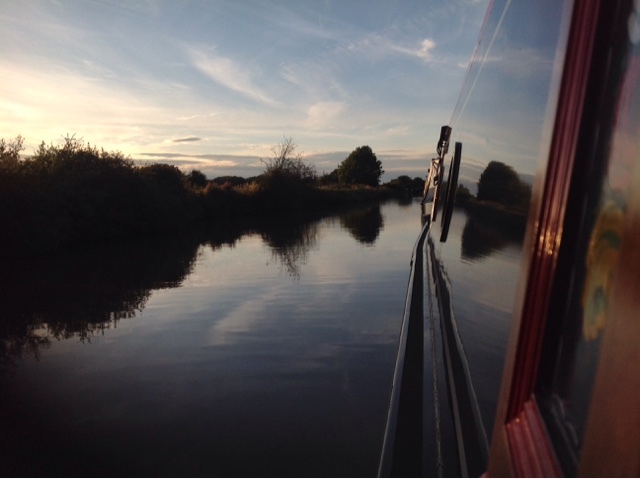 Our planned destination Wrenbury, was six miles and four locks away. Passing through Quoisley Lock we met Ken, an old boy who attends the lock daily with a wheelbarrow containing useful supplies. He always helps with working the lock, even if not buying, but today we purchased a bunch of fresh carrots and some firefighters. Hopefully the latter will not be required for a few months yet. 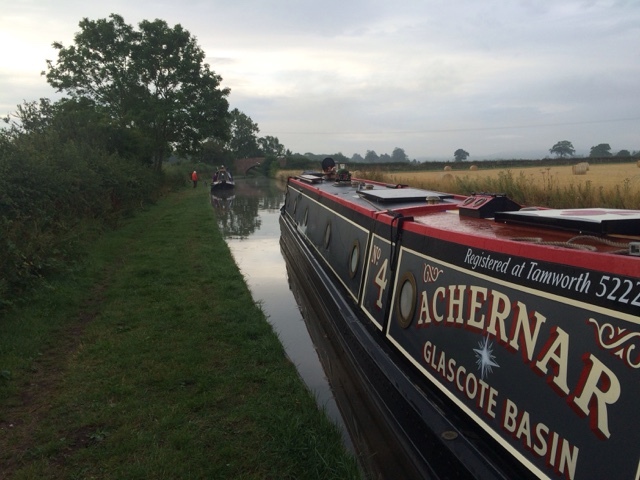 On arrival at Wrenbury we pulled into the ABC hirebase for fuel and water. This has now made it onto my list of ridiculously slow filling water taps. Over an hour, and the tank was still not full, but we had enough to last us a few days. We moved on a short distance to the 48 hour mooring zone, just before the manual lift bridge and stopped for the day. We had timed it perfectly as it was now 1 o'clock, and a Sunday roast at the Dusty Miller was beckoning. Watching the countryfile weather forecast last night, it appears as if mid week we may get wind and rain, so this morning we made the decision to move again. Not long after navigating the three locks at Baddiley we were passing an ideal spot, so we stopped. I expect we will stay here for a couple of days now. Since departing Yelvertoft in March, the boat engine has been run for 240 hours so far, and an oil and filter change is soon due. Originally, our planned route home was to be via the Middlewich Branch of the Shropshire Union and then onto the Trent and Mersey canal. With this in mind we have arranged to purchase some oil from Aquaduct Marina on the Middlewich Branch, as they stock the specification of oil required for our engine. The change in our plans is that, from this point we are then going to return and follow the same route on our journey back. Our reason being, we both like the Shroppie and have not quite finished exploring it yet. The Trent and Mersey and Harecastle Tunnel will have to wait for another year. Checking the map our mooring spot is adjacent to the small village of Ravensmoor. 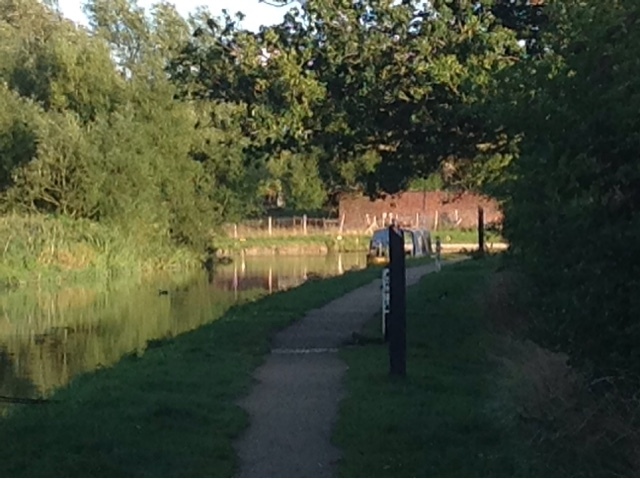 It is about a mile away over the fields, with a convenient footpath from bridge 12. The book also states the village is the home of the Farmers Arms P.H. which will need to be checked out, probably during our walk tomorrow.